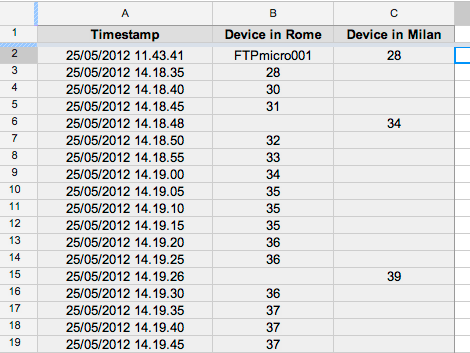 [Emanuele] is using Google Docs to log his temperature sensor data automatically (translated). We can see a few benefits gained by using this system. One is that you don’t have to visit the site of the logging hardware to harvest the data, another is that Google will automatically graph the data for you. Of course this means you need some way to connect your logger to the Internet, but we’ve seen buckets of different techniques for doing so. In this case, [Emanuele] is using PIC hardware that has a NIC on the board. But the technique could be used from a computer just as easily as from a microcontroller. The meat and potatoes of the hack is sniffing out the HTTP header and syntax for writing to cells on a Google Docs (soon to be Google Drive) spreadsheet. After making a new spreadsheet and copying the URL and key from the address bar, he loads up the page using a header-viewer web service. With all the pertinent info in hand he crafts about a dozen lines of code to assemble the HTTP packet, and rolls the timestamp and temperature reading into it dynamically. See the system in action after the break. a formula? The URL method above is text based so =B1+B2 will be send as text, not as a formula? Change the spreadsheet with formula’s won’t work either google append the parameters to the worksheet. I’m looking for a straightforward way to collect thermocouple data to an online space like googledocs. this is interesting and a great accomplishment. but personally, i feel this would be usless if logging anything that might/will coincide with internet being lost… like earthquakes(sisemic detection) poweroutages(voltage spike monitor) ect. or anyother cloud service whenever possible. EDIT: i know hotmail is cloud based, im talking about things that can and always have been done locally. EDIT: … or they might just publish/sell your stuff 5 mins b4 presentation and when teacher checks if its copy&pasted from the internet… automatic expulsion and you’ll NEVER EVER get into a university. and Ruthless Efficiency… Fear, Surprise and Ruthless Efficiency are our three greatest wepaons !!.. another way of interfacing with Google docs would be Google app script ( https://developers.google.com/apps-script/) . you could also react to certain values (e.g. temperature Spikes) by sending out emails. My experience, and others, have been that the google app script api’s are horrifically buggy and not at all reliable. I’m trying to get a similar setup working for my beer fermentor. Right now I’m leaning towards Cosm (formerly Pachube). Does anyone have some experience with this site? Currently I have a $25 Pogoplug running arch linux with an arduino attached that’s reading several dallas digital temp sensors. Google has certainly changed the manner in which spreadsheets are update since this article was written. I’ve been trying to sniff this out for a week. I’m not a programmer, and I’m not well versed in any language except AutoLISP (learnt many years ago). Has anyone played with this topic since Docs converted to Drive? how it is using arduino and ethernetsheild..